Treated wood floor with 12" on center floor joists. Plans come with option of building a 4' or 5' double door opening. 2 materials lists - one for building your shed with listing all cut lengths and angle cuts, the other to use when shopping for materials for your shed. Roof trusses which you build with gusset plates. 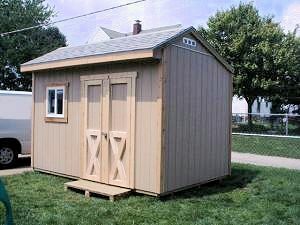 This storage shed can be built with engineered smart side pre-primed siding (shown in plans) or use any siding of your choice. Plans include blueprints for adding a ramp to your shed. As you can see by the roof profile, a saltbox shed does not have a standard symetrical roof. The front side of the roof is shorter to the peak, while the back of the roof is longer from the peak back. These shed plans are $6.95 and are instantly downloadable and available by clicking the 'Buy Now' button below. Please make sure any email from shedking.net or ejunkie.com does not go into your junk or spam email folder. The plans and building guide are 39 pages in length and are in pdf format. If for some reason you do not immediately receive the link to download the plans, please send me an email at shedking@gmail.com and I will attach the plans to a reply email for you.